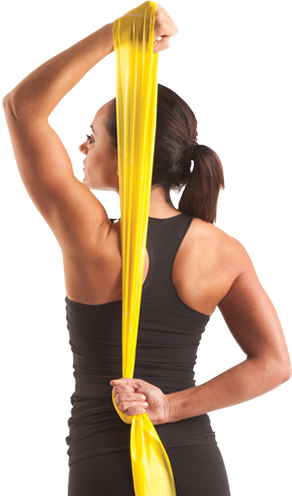 TheraBand™ products are the original pedigree and best system of progressive exercise with a clear commitment to professional quality, effectiveness and durability. If it doesnt say TheraBand on the box or tube, it's an imitation. The TheraBand portfolio includes tubing, band loops, latex-free options and other configurations. A range of colours support movement through progressive levels of exercise. This newly patented, latex-free product is the definition of versatility. TheraBand CLX Easy Grip Loops, completely eliminates the need to ever tie knots again. CLX provides multiple unique grip options and exercise possibilities like open and closed hand motions, holding sport specific objects during resistance training, and even no grip required exercises. band, loops, tubing, handles, and door anchor. 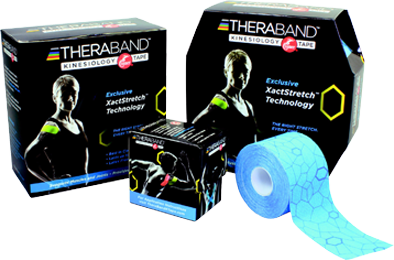 TheraBand XactStretch Kinesiology Tape is the secret used by Olympians, elite athletes, and sports medicine professionals. Research proves kinesiology tape can help all people work better and play harder by reducing pain and providing support to sore muscles and joints. TheraBand Kinesiology tape strikes the perfect balance between treating damaged tissue whilst maintaining full range of motion. The introduction of XactStretch has revolutionized the application process. This scientifically-designed indicator, allows experts and beginners to apply with an individually prescribed amount of stretch. Tape stretch indicators for perfect application every time.